Finding undiscovered talents is something that football’s smaller clubs have to do to survive. While the giants of the sport can spend lavishly on the best players in the world, those with much smaller budgets need to be shrewder in their recruiting. Italian side Sampdoria is one of those clubs, and the Doriani have found an abundance of football talent recently for excellent bargains, such as Mauro Icardi, Shkodran Mustafi, Roberto Soriano, Lucas Torreira, and Patrik Schick. From March 2009 until June 2011, as well as another spell from July 2014 until June 2018, the club’s chief scout Riccardo Pecini discovered such prospects, and the latest one of his discoveries to emerge is a young Dane that he scouted in the Eredivisie. Joachim Andersen has emerged as one of the brightest young talents in Serie A and the young centre-back has attracted the interest of some of Europe’s biggest clubs. He has reportedly attracted the attention of the Big Three in Italy, with Inter apparently showing more interest than AC Milan and Juventus, while there is also speculation out there suggesting that Premier League clubs Manchester United and Tottenham Hotspur want to purchase the 22-year-old. So far this season, Andersen has played 27 times in Serie A, only missing out on the 2-1 defeat away to Juventus due to suspension after accumulating three yellow cards in the previous league matches. While new arrivals Omar Colley and Lorenzo Tonelli have been fighting it out for one of the centre-back spots, the young Dane has been a regular mainstay in the Doriani rear-guard throughout 2018/19. This has been a remarkable transformation for Andersen, as he found playing time hard to come by in his debut campaign with the Blucerchiati. The Danish defender was purchased by Sampdoria from Dutch club FC Twente in the summer of 2017 for just €1.4 million, but he found playing time hard to come by during his debut Serie A campaign. Argentinian veteran Matías Silvestre and Italian international Gian Marco Ferrari were the regular centre-backs under Blucerchiati tactician Marco Giampaolo. It was on November 28, 2017 that Andersen made his competitive debut for Il Doria, featuring for nine minutes in their 4-1 victory against Pescara in the Fourth Round of the Coppa Italia. He had to wait another three months to make his Serie A debut, featuring for five minutes in a 2-1 win against Udinese. After that cameo against the Zebrette, Sampdoria lost their following three league games, causing Giampaolo to bring him into the starting line-up. He started in a rescheduled league game against Atalanta, which Il Doria won 2-1 in Bergamo, and he impressed in defence with calm nature and tidy ball distribution. With Silvestre being allowed to move to Empoli in the summer and Ferrari returning to Sassuolo, the Dane had an opportunity to establish himself as a starter at the Genoese club. Giampaolo placed the defender in the starting line-up in the 1-0 victory against Serie C club Viterbese in the third round of the Coppa Italia in August 2018, and the starlet maintained his place in Samp’s 1-0 defeat to Udinese in Serie A later that month. Despite the defeat, Andersen kept his place in the team until Sampdoria’s 2-0 win against Chievo in Round 18, and he was reinstated once he served his one-match ban. Remarkably, he has not been substituted once during the campaign. Throughout the season, the Danish defender has impressed with his maturity beyond his years and his clean style of play, which compliments the more physical styles of Colley and Tonelli perfectly. He’s calm and collected in 1v1 duels, he can compete in the air, he is clean in the tackle, and he is tidy on the ball. Although he is capable of playing long passes, he will usually look to play it short or play a through-ball. According to WhoScored.com, Andersen averages 1.3 tackles per game, 1.3 interceptions, 4.7 clearances, 5.7 long balls, and 63.6 passes a game, which is the fifth-highest in Serie A so far. He also has a passing efficiency of 89 percent. With the ball-playing central defender becoming more fundamental than ever, a player like Andersen is ideal for the possession-based philosophy of Giampaolo at Il Doria. The Dane has earned comparisons with Inter defender Milan Škriniar due to the role they play and because, like Andersen, the Slovak was also discovered by Pecini at Sampdoria. “I’ve read and heard these comparisons many times before, but they don’t bother me,” Andersen told Sky Sport Italia in January this year. “I’m my own person, even if I understand the comparisons because we’ve played for the same club at a young age and, like me, didn’t play at first. Andersen has credited his coach Giampaolo for his development at Sampdoria but he also brushed aside any transfer speculation of him leaving the northern Italian club at the end of the season. “I’ve learned a lot from him and I’m very happy that he’s my coach,” he added. “He’s one of the reasons I came here because I knew he was a great coach. “He’s someone who really takes care of the smallest details. For me, that’s very important as a defender. 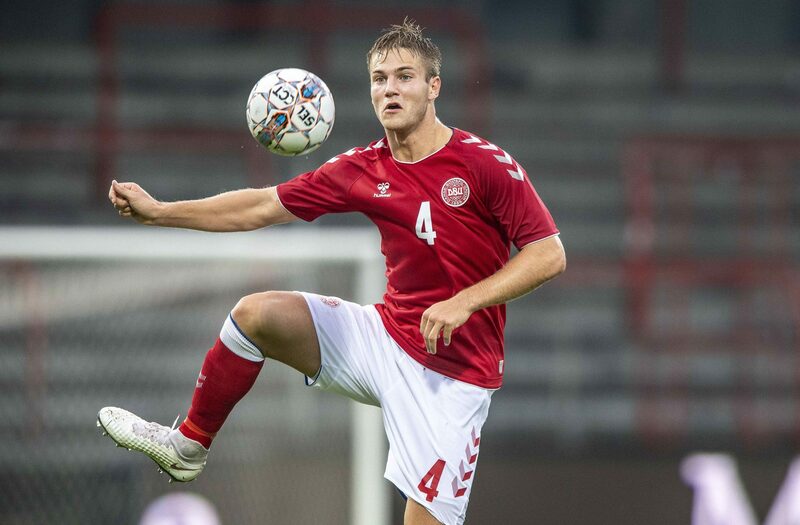 After years of being a youth international with Denmark, Andersen has been selected by Coach Åge Hareide to play for the senior squad in a friendly against Kosovo on March 21 and a Euro 2020 qualifier against Switzerland five days later. Competing for a spot in defence with the likes of Chelsea centre-back Andreas Christensen and Sevilla veteran Simon Kjær will not be easy, but his improvement at Sampdoria suggests that the 22-year-old is capable of establishing himself in the Danish national team in the near future. Unfortunately for Blucerchiati supporters, it seems inevitable that Andersen will be sold at the end of the season. Defenders, like footballers in other roles, often arrive as hidden jewels and leave the Ligurian club once they are polished off. Pecini, the man who discovered Andersen, is now the general director at Empoli, but Samp sporting director Carlo Osti and veteran technical director Walter Sabatini have still been able to construct a strong enough squad for Giampaolo to work with. Like most footballers that have played for Sampdoria, Joachim Andersen is another player that will have to be sold and then be treasured elsewhere.